TEGUCIGALPA, Honduras (CNN) -- Brazil on Sunday rejected an ultimatum from Honduras' de facto government to decide the status of ousted President Jose Manuel Zelaya, who has been holed up in the South American country's embassy in Honduras since last week. 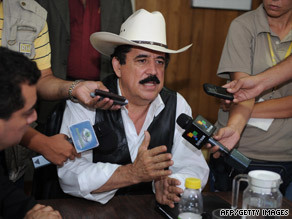 Ousted Honduran President Jose Manuel Zelaya talks to reporters Thursday at the Brazilian Embassy in Honduras. In turn, the de facto government of Roberto Micheletti refused to acknowledge the embassy as Brazilian soil, deeming it a "private office." "It was Brazil who broke relations with the current government, when they refused to recognize it," said interim government Foreign Minister Carlos Lopez. "So we are just doing the same with them." However, he said, that does not mean Micheletti's government "will lose its courteous and civilized manner, and will go inside the establishment, just because the seals are coming down." Micheletti's government also refused to admit five of six representatives from the Organization of American States after the group arrived at the Tegucigalpa airport. Of the group, which included two Americans and one Canadian, only OAS Special Adviser John Biehl of Chile was allowed to stay, though the reason remained unclear. "We don't know why we weren't allowed in because the de facto government agreed to accept us," said OAS spokesman Alvaro Briones in Washington. Micheletti has accused Zelaya of using the embassy to instigate an insurrection within its borders, and gave the Brazilian Embassy 10 days to decide the status of ousted president, who took refuge there. "Since the clandestine arrival to Honduras by ex-president Zelaya, the Brazil embassy has been used to instigate violence and insurrection against the Honduran people and the constitutional government," the secretary of foreign affairs for Honduras' de facto government said in a statement late Saturday night. Upon his unexpected arrival at the embassy on Monday, Zelaya said he returned for "homeland, restitution or death." Brazilian authorities said they told Zelaya to avoid inflammatory language, and Zelaya has said he is seeking to meet with Micheletti's government to find an end to the political crisis peacefully. At a summit in Venezuela between leaders of South America and Africa, Brazilian President Luiz Inacio Lula da Silva said Brazil "doesn't accept ultimatums from coup-plotting governments," referring to the de facto rule of Micheletti, who was named president after Zelaya's ouster in a military-backed coup in June. Lula said that his government had nothing to negotiate with Micheletti, and that Zelaya was a "guest" of the Brazilian Embassy in the Honduran capital. Micheletti's government on Sunday night ordered all media outlets to cease publishing or airing "any images that threaten peace and public order, or insult the human dignity of public servicemen." An attorney for Channel 36 had said earlier that the Honduran television station was shut down by authorities. The channel temporarily broadcast color bars and a message in Spanish: "This is what they want -- the coup of Micheletti." The Honduran statement said Honduras would be forced to take measures against Brazil if the latter did not define its position on Zelaya. It did not specify what those measures would be. "No country is able to tolerate that a foreign embassy is used as a command base to generate violence and break tranquility like Mr. Zelaya has been doing in our country since his arrival," the statement said. On Friday, Zelaya said he and supporters were victims of a "neurotoxic" gas attack that caused many people to have nose bleeds and breathing difficulties. Micheletti said his government did not launch a gas attack on the embassy. CNN's Kim Segal and Esprit Smith contributed to this report.